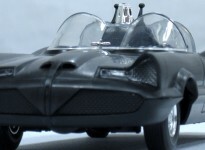 We roll out another one of our hopefully regular features as we cover custom batmobiles (and other bat-vehicles) as well as the strange, kooky and unique. In this first effort we have a little of all of those. 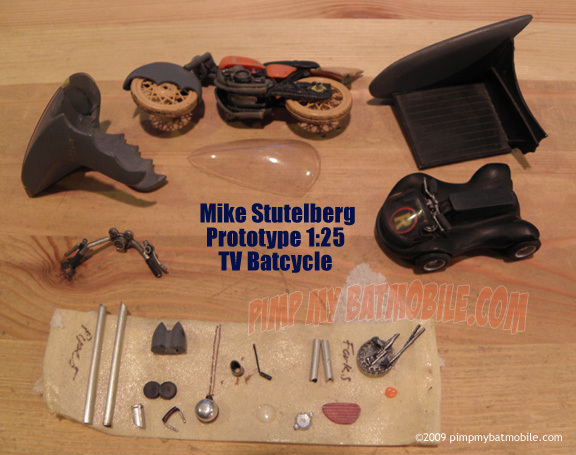 Some of you may have heard me discuss modeler/artist/designer Mike Stutelberg in the past. 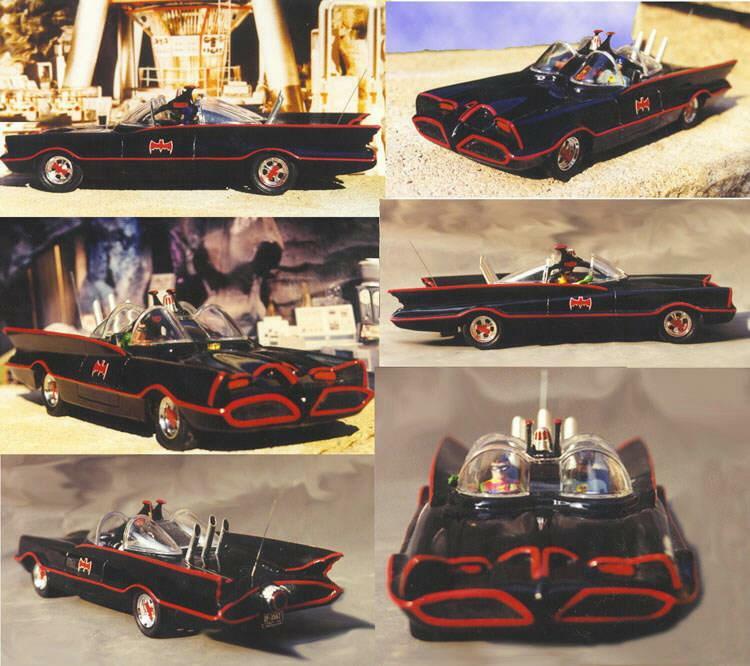 Mike is a huge bat-fan and has worked for some major model companies behind the scenes on many projects we’ve all come to love over the years including the Polar Lights comic-version Batmobile kits and the re-releases of the Aurora bat-models. Mike designed the masters for the Horizon 1:25 Whirly Bats and did most of the instructions and artwork for the packaging. Over the years, I’ve talked with Mike extensively about his work with these companies and there’s a single thread that runs through the stories. Every time Mike has gotten in with one of these projects he’s tried to bring us real bat-modeling fans some new thing that would make our hobby more exciting or easier. And always, he gets really close with some small victories – only to have something big and great get yanked at the last minute like Lucy and the football. I’ve got stories and artwork and photos you wouldn’t believe. One of the great “almost made it” stories is the subject of this week’s photo and feature. I am a die-hard 1:25 scale fanatic. I am very reluctantly forced to embrace this 1:18 world simply because I’ve been outvoted and outgunned but my heart lies in 1:25 scale. It’s one of Mike’s scales of choice as well. There have been great 1:25 Bat-models offered over the years. But you had to dig for them. In the 90’s we had some very nice 1:25 Batmobile kits and conversions by T&T, Magnetic Models, Skyhook etc. as well as the king of them all – The Caped Custom. I have built and sold scores of 1:25 Batmobiles and decided early on that it was the best scale for a Batcave diorama. Then someone (ahem) convinced Polar Lights to reissue their Aurora Batboat in 1:24 scale instead of its original 1:32 size. Hooray! The next obvious vehicle would be the TV Batcycle. As with many of Mike’s labor of love projects, the top dogs at the modeling company at the time took a look at it and said. Nahh. We’ve already got the Aurora Batcycle modafinil 200mg molds. People like bigger models. You can’t sell a 1:25 motorcycle kit. And so on. As you can see from the photo of the prototype – it would have been a gorgeous model. But it gets worse. I begged Mike to send me the kit, convinced that I would be able to get enough garage interest in it to justify making a short run of the thing in resin for a select group of modelers. But I received it right before a lot of things in my life hit the fan and it sat for a couple years. And a lot of things changed in the hobby during those years. Many people got their hands smacked for selling garage bat-kits thanks to at least one malicious, misguided manufacturer. 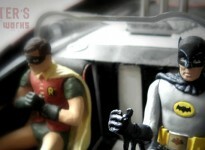 People stopped making and selling resin Batmobiles. I had a fairly nice big Mego-scale1:8 TV Batmobile kit (that will be featured later) that we just plain could not sell to anyone. It never made its molding and casting money back. Two modelers tried making 1:16 Batmobiles and the longest-drawn-out garage kit in history- a 1:18 batmobile kit – was eeked out by the ones and twos and nearly bankrupted the designer. In all – the garage bat-hobby suffered a major economic and interest-level downturn. I could not get anyone interested in the idea of a 1:25 Batcycle kit. “Boy that’s small.” people would say. “Yes, but it will match your car and boat!” I’d say. And they looked at me like I was crazy. So I came to realize that nobody would be buying this kit if I were to make it and if I wanted the one-off just for myself it would cost upwards of $1000 for all the parts and decals to be done right. Well. I’m a scale stickler but – hey for that money I thought maybe I’d just scrounge one together on my own. Then Hot wheels came out with their beautiful 1:32 Batcycle (NOT 1:50, say it with me loud – NOT 1:50) and I almost cried. here was a diecast, beautifully done (the best of all their efforts in my opinion) TV Batcycle and it was TOO. F*&#ING. SMALL. But – not too small that we can’t put it in front of a 1:25 Batmobile and hope for some forced perspective action! So – here we are. I reluctantly shipped the Batcycle prototype back to Mike the other day. Maybe someone will turn it into a model someday. But for now – I will be breaking the cardinal scale adherence rule and hoping nobody notices. So that’s the story of the Batcycle model that nobody wanted. 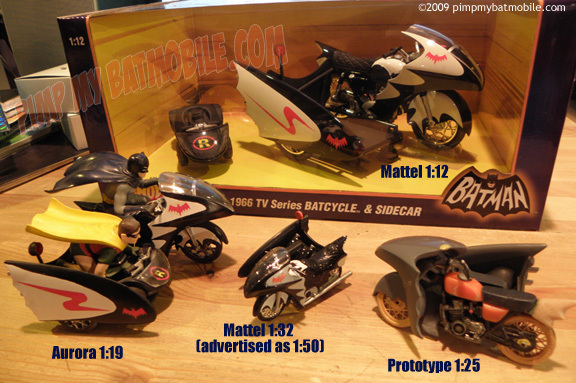 Here below is a scale shot that compares the different Batcycle models mentioned above.